When a person wears tefillin he must remember that G-d commanded us to strap these four Torah passages containing the oneness of His Name and the exodus from Egypt on the arm, which corresponds to the heart, and on the head, which corresponds to the brain. This is to be done so we remember the miracles that G-d performed for us and His oneness that he displayed to us—demonstrating His supreme power and control over the upper as well as the lower worlds. And man must subject his soul to G-d, which is located in the brain as well as the heart—the main areas of our thoughts and desires. The tefillin contain four passages from the Torah. The tefillin of the hand includes all passages in one box, and the tefillin of the head contain the passages in four separate chambers. The tefillin of the head have a three-pronged shin engraved on one side and a four-pronged shin on the other. The way the straps are tied form the shape of the letters dalet and yud. Together they enwrap and connect a person to the holy Name of protection, Shadai. The four head chambers contain the Torah passages corresponding to the four parts of the brain. When a person places them on the part of the head known as a baby’s “soft spot,” and ensures that they do not slip downward toward the forehead (but rather they remain at the hairline), he is placing them at the physical “gate” of the soul that rests within the brain. This allows the soul to connect to the eternal light, which infuses it with illumination. Conversely, the tefillin of the arm, which rest upon the bicep muscle angled toward the heart, transmit their light to the spirit that resides within the heart (the spirit is the source of emotion while the soul is the source of thought and logic). A person who wears tefillin every morning will be able to start his workday with a more illuminated soul and spirit. As a result, he will make fewer mistakes at work and will have an easier time overcoming resentments and other negative emotions. After all, the tefillin have done their job for the day. For G-d wants us to be awash with the light of His holiness from head to toe, to irradiate that out to the rest of the world, and to thus allow for a great deal of rectification…We’re taught that our soul most especially exhibits itself in our heart and brain. The head tefillin allow the holiness we spoke of before to infuse the brain, and the arm tefillin allow it to infuse the heart. Thus both our brain and heart—and the whole of our being, accordingly—are rectified in the process, awash in G-d’s holiness, and thus sanctified. Indeed, according to studies conducted on auras, when a person wears tefillin, his spiritual level rises, as discussed at length in The Coming Revolution. Just like an audiovisual device can work through a single antenna that receives waves from the atmosphere transmitting its content into a broadcasting device, tefillin operate in a similar way within the soul of man, as they receive the Divine light from the spiritual realm, infusing it into the depths of the soul. However, to the layman, the tefillin give the appearance of meaningless black boxes attached to black straps. This is perhaps the same way a forest dweller would perceive an antenna and a satellite dish sitting on a rooftop. He’d say that the antenna is a useless rod and the satellite is a worthless metal plate that surely could have been put to better use. But a knowledgeable person understands that the shapes of these devices is what enables them to receive special waves and transfuse them into receivers, connecting a person to all that is happening in the world. The Coming Revolution also discusses the findings of Dr. Steven Schram, an expert in acupuncture and chiropractic medicine. He proved in an article published in 2002 in the British Journal of Chinese Medicine that the areas of the body that the head and hand tefillin come into contact with precisely overlap the acupuncture points responsible for spiritual elevation and clarity of thought, according to Chinese medical theory. However, to us it is clear that these matters are much more profound. The Zohar teaches that the four chambers of the tefillin correlate to the four heichalot (sanctuaries). The Heichal corresponds to the Name Adonai, as they both contain the same numerological value, and to the Name Havaya, whose four letters correspond to the four Torah passages contained inside the tefillin chambers. 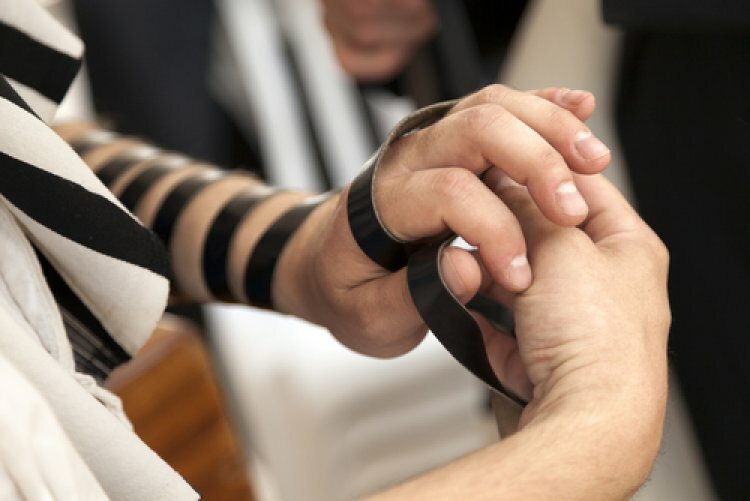 When a person binds the tefillin straps, they act as ropes that restrain the forces of the Sitra Achra from harming him. The straps also inhibit the effect of the evil forces and guard him from becoming a harmful person. The Zohar continues that when a person wears tefillin he achieves the likeness of G-d by virtually transforming into the Name Havaya (yud, hey, vav, and hey). How does this occur? His head and neck form the letter yud, the five fingers of his two hands correspond to the two heys, while his body is shaped like the letter vav—this configuration gives the person the form Havaya. The only thing missing is the prong of the letter yud. This prong contains the secret that connects the entire physical and spiritual universe to the eternal light. When a person wears tefillin, he is essentially completing the shape of the Name Havaya by placing the prong of the yud on his head. This is the channel that connects him to the eternal light and infuses him with the illumination of the Creator. When a Jewish man wakes up in the morning and wraps himself in a cloak called a tallit and dons a crown called tefillin, he receives a high level of spiritual and physical protection, and thus connects to the upper networks that give him an eternal illumination of the Holy One, blessed be He. However, this is only if he’s consistently mindful of the fact that he’s the son of a King and must therefore dress in the royal garb before starting his day. Although it’s true that during the course of the day he works to make a living like any average person, he must always remember to act like royalty. He may not eat the same foods that non-Jews eat, he must not allow random images to enter his mind by seeing forbidden images, he must also be careful and respectful when handling other people’s money, and so on. Shulchan Aruch, Orach Chaim 25:5. “The Aura of Man and the Tefillin,” p. 268. Zohar Chadash, Tikunim, vol. 2, p. 69b.